This lesson is for System Administrators or users responsible for review state data extracts. 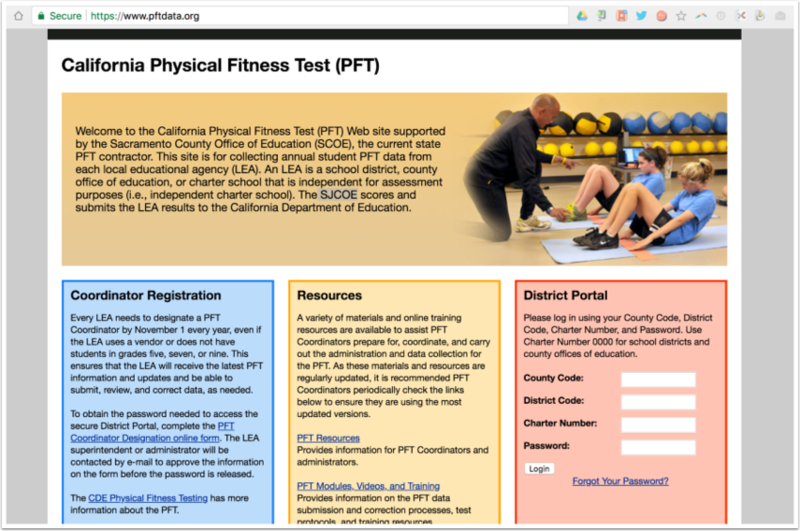 The PFT Data Extract page is used to generate the file that you will need for your California Physical Fitness Test. NOTE: This is currently only available for California clients. Use the PFT assessment Tool to administer and collect results. The data extract will generate and create a file specifically to the state's requirements with may include formulas and other criteria not visible seen on the view. Make sure to review and collect student responses by visiting Enter, Edit, & Manage PFT Student Responses. For state submission, you will also need your San Joaquin County Office of Education login to upload and turn in results. Additional permissions will be needed to the person responsible for review, validating and creating a file to submit. 2. Under Admin, select PFT Reporting. You wil land on the PFT Extract page. 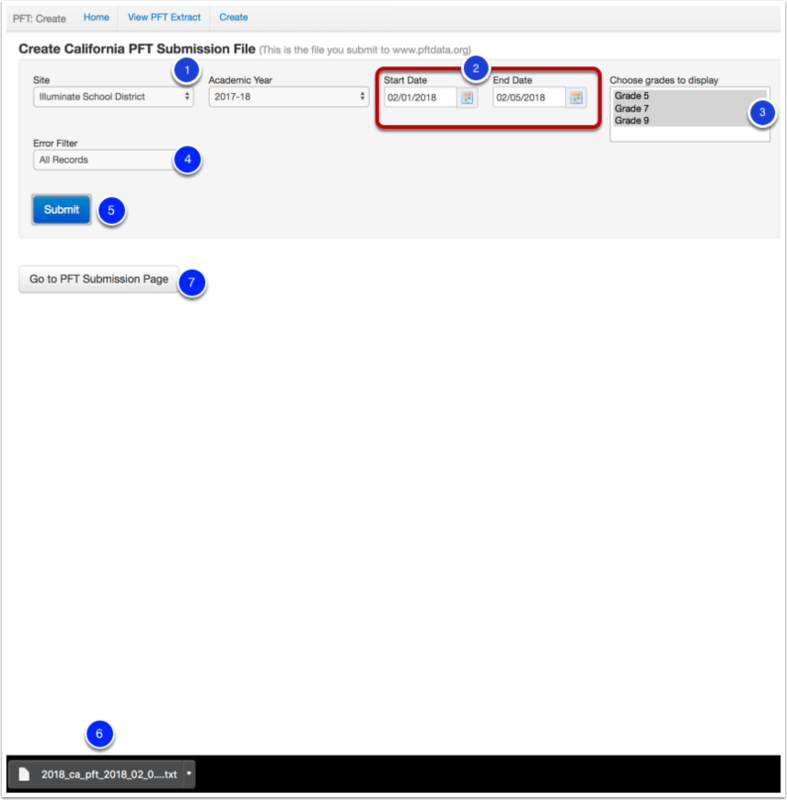 From here you can View PFT Extract (1) or Create a PFT Submission File (2). You can also click the Go To PFT Documentation (3) button to view state informational documents on the Physical Fitness Test requirements. Use the filters to select what PFT data you wish to see. By default, all data options will be selected to run under the current academic year. Enter the Dates, typically the administration window of 02/01-05/31 are entered. These values remain sticky within the tool, so they do not need to be selected again. Required to be reported are all grades 5, 7, and 9. By default, all reported grade levels display. However, you can unselect to change the view of the report which can help with faster validation and review. By default, all Student Demographic values are selected. However, you can unselect to change the view of the report which can help with faster validation and review. By default, all PFT Assessment Data values are selected. However, you can unselect to change the view of the report which can help with faster validation and review. By default, All Records will be selected in Error Filter. This is generate a view of all records. Additional options include Records with Errors and Records without Errors. Why Error Filters? Error filters provide you an opportunity to review, validate, and in some cases fix the data. Particularly in Student Demographic Information. As a DNA Client, your Student Demographic information is pulling from your Student Information System. This means any errors will need to be correct in that system. Illuminate is just a reflection of your student data. As an ISI Client, your Student Demographic information is pulling directly from Illuminate, which can be corrected in its designated place. For any and all data assistance, feel free to reach out to your Implementation Manager or Support Specialist. Click Submit to view the selected results. 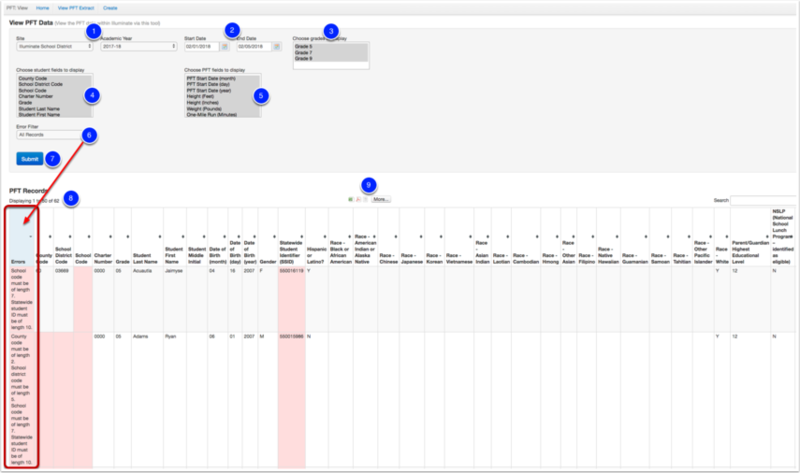 Based on the selected criteria, a spreadsheet like view will show all required values needed to create and submit. If there are any errors, they will be highlighted in red, and to the far left you will see an 'Error' column that will guide you as to what needs to be fixed. Additional Options to download the data in other format is available, keeping in mind this will not be a file ready for submission but just for validation and review. When ready, select Create when create a file to submit or turn into the state. Confirm the Dates, typically the administration window of 02/01-05/31 is entered. These values remain sticky within the tool, so they do not need to be selected again. Required to be reported are all grades 5, 7, and 9. By default, all reported grade levels display. Click Submit to create a file ready to submit to the state. A ready-to-go file will Download to your device, ready to be uploaded and sent to www.PFTDATA.org. Note where the file is stored on your device. Beware of Gremlins! Seriously, its a technical term that means if you open the file, you could tamper with how the data is being formatted for state specifications which can including leading zeros, suffixes, hypens, prefixes, calculations and more. But, I want to see? Nope, don't do it. At least not this file. This is ready to send to the state! When ready, select Go to PFT Submission Page to turn in your results! Sign into your account and upload the unopened file previously downloaded as appropriate in your account. The assessment tool instantly records and provides a variety of prebuilt reports based on administration. Visit Physical Fitness Test (PFT) Report Abstracts for available reports. State Assessment results for PFT will not be provided until October. When receiving the file, visit Upload State Assessment Data to get started. Want to see what other State Assessment Data you can import? Visit California State Assessments.